Here's a little secret about me: I am not a serious coffee drinker. I'm embarrassed to say that, especially given that I come from one of the most serious coffee drinking regions of the country. There's also this weird perception that people who don't drink coffee are weak or mild-mannered or unsophisticated; I like to think I'm neither of those things, but maybe not? I really don't know. But the truth is, I don't need coffee to survive. I love the taste of it, sure, but I function perfectly well without it. Caffeine affects me too much for it to be a daily thing — I want to be able to come home from a hard day's work and crash completely without laying awake in bed from any residual caffeine in my system. Even now, I only drink coffee socially with friends, when I'm fighting jet lag, or putting in long hours at an event or press trip situation like the one I'm currently on (CheeseCation with Vermont Creamery!!!). Of course, living in such coffee oriented places like Portland and San Francisco spoiled me. The last tech company I worked for had an on-site barista that doled out free, made-to-order espresso drinks made with beans from indie roasters that rotated on a weekly basis. So even though I wasn't a frequent drinker, I developed a taste for it anyway, discerning the good coffee from my favorite small batch roasters from more generic and poorly roasted brands. AND YET — even with all that exposure to some of the best (and most pretentious) coffee in the world, I still retained a soft spot for the overly sweet and sugared coffees from my youth. In a pinch, I'll walk into any Starbucks and order a tall iced caramel macchiato. And of course, at any bahn mi, pho, or Vietnamese restaurant, I'll cave and order a Vietnamese iced coffee. If you're unfamiliar with Vietnamese iced coffee, it's basically this: think of the most boring, basic cheap coffee you can find, and brew it very strongly to the point of bitterness. On its own, it tastes forgettable and perfunctory, like the sad final dregs of the office coffee pot. But then you top it off with sweetened condensed milk and ice, give it a good stir, and bam! You have a weirdly, well-balanced iced coffee drink. Well... okay, it's a little on the sweet side, but in the way that a tall iced caramel macchiato and a pumpkin spice latte from Starbucks is too. And if you follow me on Instagram, you'll know that I went and made this drink into a cake a few weeks ago. This is the first recipe of mine that nearly incited a riot: several of you kept DMing and hounding me in comments for OTHER baked goods, asking me when the recipe was going to go live. Good grief! I blame the frosting; I'd followed this frosting technique for galaxy cakes I found on Instagram to create mocha fudge swirls that looked like an iced coffee recently stirred. 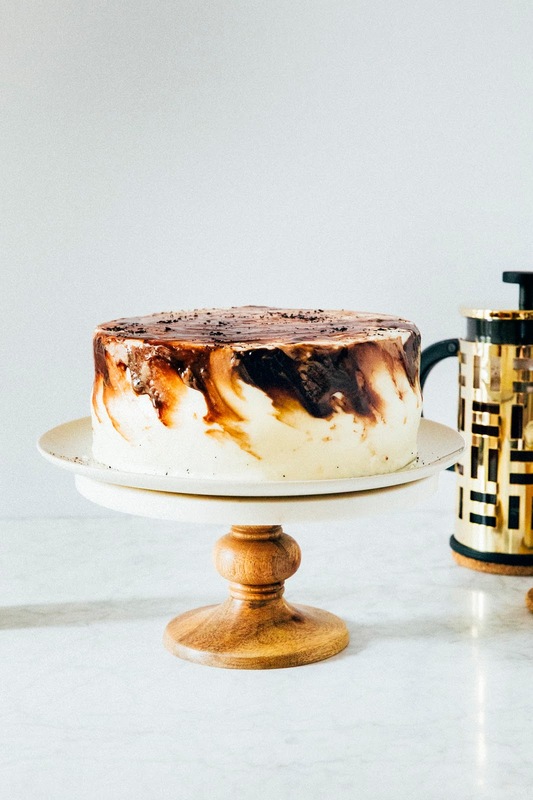 So without further ado, here it is — the recipe for Vietnamese "Iced" Coffee Cake. Enjoy! To get the "swirl" effect, I used this technique for galaxy cakes that I found on Instagram. I try my best to walk you through it in the recipe instructions, but that video is probably going to be more helpful than whatever I say. 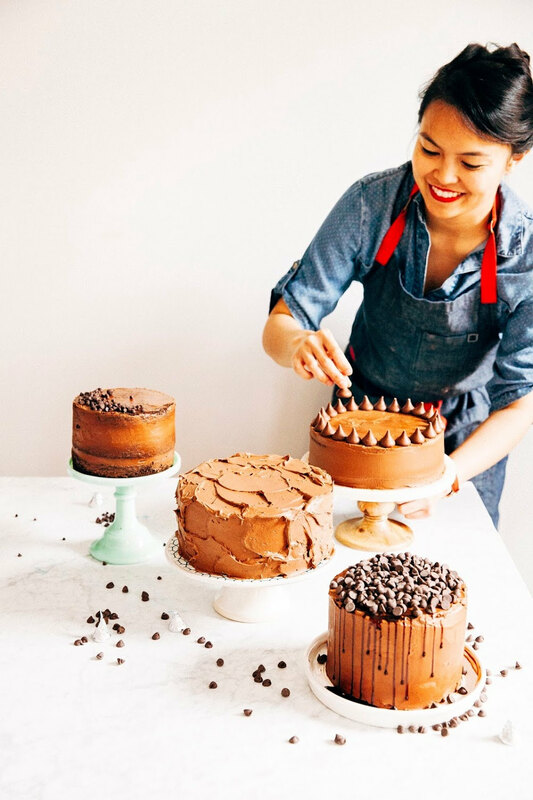 It's pretty easy to pull off, but you do need to know basics like making a good, even layer of frosting for your cake for the technique to work properly. I recommend using a crumb coat, which is a thin layer of frosting that helps seal any loose crumbs in, before frosting the cake completely. If you're not feeling confident about your crumb coating and frosting abilities, I recommend watching Martha and Stella's videos and reading all about it on Tessa's blog. Oh, and a rotating cakestand (like this one, which made it on to my Essential Equipment list) is a freaking miracle worker. I also share some additional tips on how to frost cakes smoothly and evenly in this Cake Decorating 101 post. In a medium bowl, combine 3 tablespoons coffee, 2 tablespoons unsweetened cocoa powder, 1 ounce roughly chopped dark (at least 70% cacao) chocolate, and a pinch of kosher salt. Whisk to combine and set aside. In a heavy-bottomed saucepan over medium-high heat, combine 1/4 cup heavy cream, 2 tablespoons granulated sugar, and 2 tablespoons light corn syrup. Stir intermittently while bringing to a boil; the moment it boils, immediately pour it into the bowl containing the chocolate and coffee (from the 1st step). Let sit for 1 full minute undisturbed. After a minute, slowly begin to whisk the mixture. Continue whisking until the mixture is glossy and silky smooth, speeding up your whisking. This will take around 2 to 4 minutes depending on your speed and strength. Transfer to a small glass jar with a lid to cool to room temperature. Store in the refrigerator for up to 2 weeks; do not freeze. Center a rack in the oven and preheat to 350 (F). Prepare two 8-inch round cake pans by spraying generously with cooking spray and lining the bottoms of each with a parchment paper circle; spray the paper as well. In a medium bowl, combine 2 1/2 cups all-purpose flour, 1 tablespoon instant coffee powder, 1 1/2 teaspoons baking powder, 1 teaspoon baking soda, and 1 teaspoon kosher salt. Whisk to combine and set aside. In the bowl of a freestanding electric mixer fitted with a paddle attachment, combine 1 3/4 cup granulated sugar, 2 large eggs, and 1 tablespoon pure vanilla extract. Beat on medium speed for 3 minutes, or until light and fluffy. Reduce the speed to its slowest setting and add 1 cup sour cream, beating until incorporated. With the mixer still on its slowest setting, slowly pour in 1/2 cup canola oil and continue beating until incorporated. Once the oil is incorporated, slowly pour in 3/4 cup coffee and continue beating until combined. Stop the mixer and scrape down the bottom and sides of the bowl. Turn on the mixer back to its slowest setting and add the dry ingredients (from the 2nd step) a few big spoonfuls at a time, beating on low speed until the dry ingredients have just disappeared into the batter. Divide the cake batter between the two prepped pans and transfer to the preheated oven. Bake for 30 to 35 minutes, or until the top of the cakes are golden and bounce back when gently poked. Transfer to a wire rack to cool for 20 minutes, before turning out onto the rack to cool completely to room temperature. In the bowl of a freestanding electric mixer fitted with a paddle attachment, beat 1 1/2 cups unsalted butter, 1 teaspoon pure vanilla extract, and a pinch of kosher salt at medium speed until soft and fluffy. Lower the mixer speed to its slowest setting and add 4 1/2 cups confectioner's sugar, turning the mixer speed back up to medium once the sugar is fully incorporated. Beat for 2 to 3 minutes until light and fluffy, and reduce the mixer speed back down to its slowest setting. Drizzle in 6 tablespoons sweetened condensed milk; once the milk has been added, turn the mixer back up to medium and beat for another 2 to 3 minutes until light and fluffy. Use immediately. If necessary, level the top of both cakes. 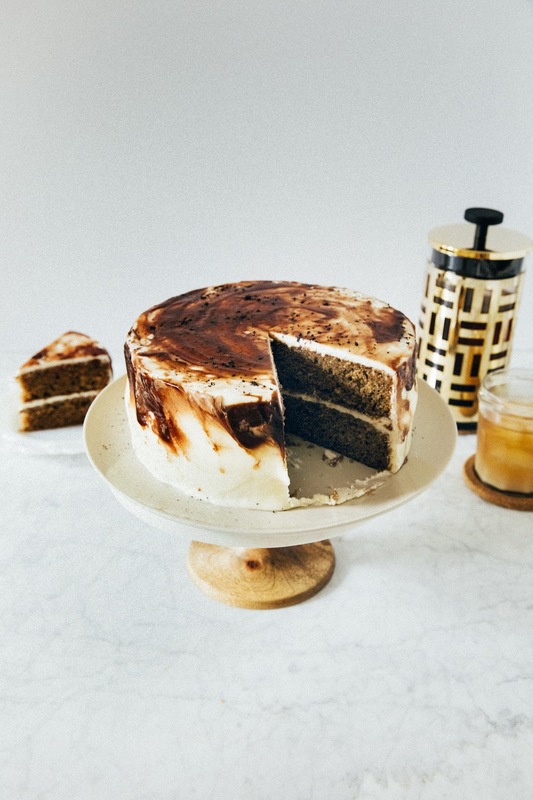 Set the uglier cake on to a rotating cake stand and scoop about 1/2 cup sweetened condensed milk frosting on its top, using an offset spatula to spread the frosting evenly across the surface. Gently nestle the second cake on top of the frosting. Reserve around 1/3 cup of the sweetened condensed milk frosting in a separate bowl — you'll need these for the mocha swirls. 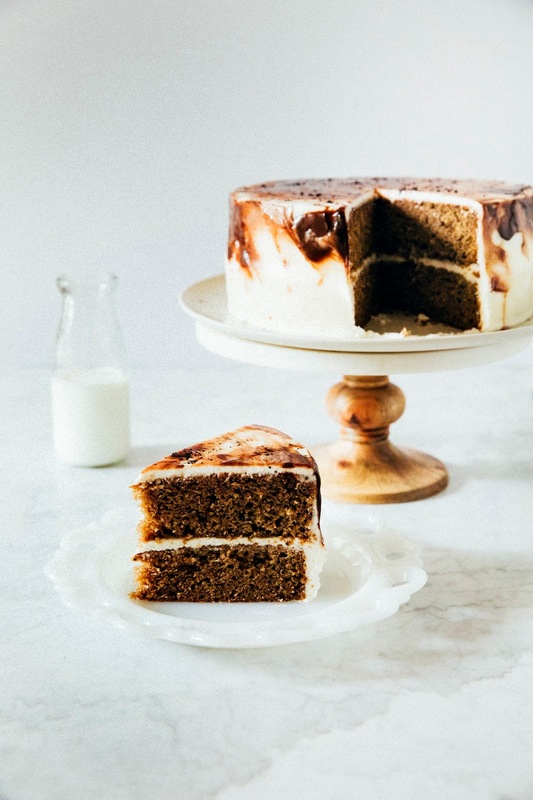 Use the remaining frosting to create a crumb coat (see baker's notes) around the cake; transfer to the refrigerator to chill for around 30 minutes until the frosting stiffens. Once the frosting stiffens, use the remaining frosting (NOT the reserved 1/3 cup) to create a smooth, even layer around the cake. Transfer to the refrigerator to chill while you make the mocha frosting. Divide the reserved 1/3 cup of frosting into two small bowls. In one bowl, mix 1 to 2 teaspoon of coffee fudge into the frosting, enough to give it an even, light brown hue. In the second bowl, mix 1 to 1 1/2 tablespoons of coffee fudge into the frosting, enough to give it an even medium brown hue distinctive enough from the light brown hue. In a third bowl, spoon out 2 tablespoons of the coffee fudge. Congratulations! 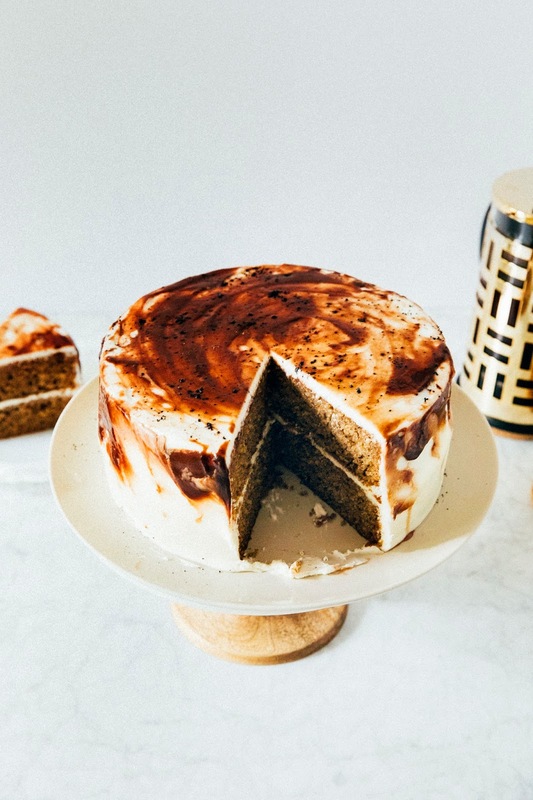 You just made the three different mocha frostings that will serve as the swirls on your cake. Remove the cake from the refrigerator. 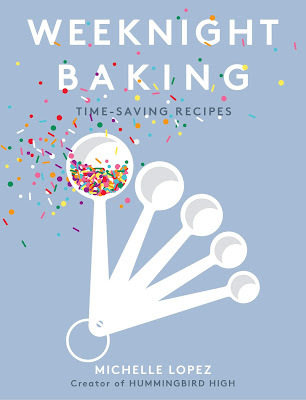 Take a small spoon or your offset spatula and dab about a teaspoons worth of frosting at the top edge of the cake, rotating from each different bowl of frosting so that you have different colored dollops of frosting next to each other. Continue dabbing until you have a border of these dollops around the top of the cake. 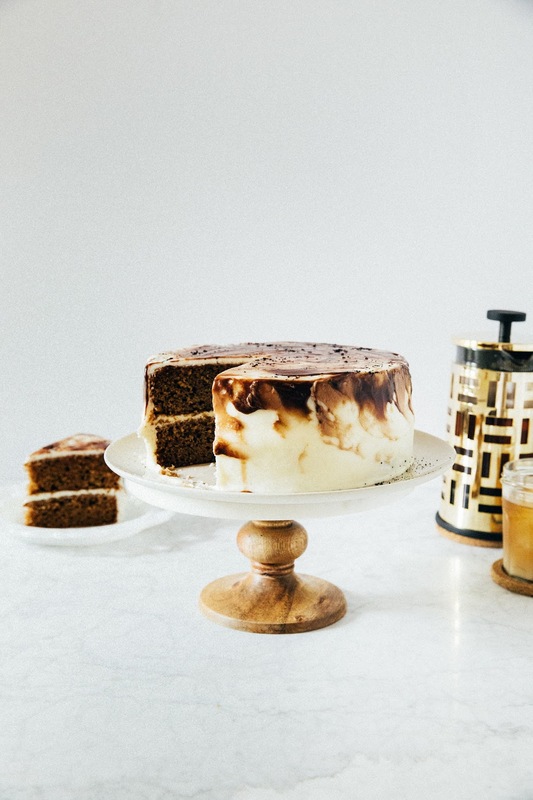 After you've bordered the cake, take your offset spatula and carefully swipe each of the dollops down the cake in a diagonal motion, rotating the cake stand slowly to help. Repeat until all the dollops are even, but try not to overwork it or you might lose some of the "barely stirred" pattern you're going for. Smoothen any leftover mocha dollops at the top of the cake, rotating the cake stand in a circle to create a spiral motion at the top of the cake. Sprinkle with ground coffee and serve immediately.